The Denver streetcar system after the abandonment of streetcar route 50 (E 22nd Ave. - Kalamath). 1 Broadway Central Loop - 15th St. - Broadway - Alaska Av. 2 Broadway Central Loop - 15th St. - Broadway - Colorado Av. 5 Berkeley / S. Gaylord Berkeley Pk. - W.32nd Av. - 16th St. - 17th St. - Broadway - E. Alameda Av. - S.Gaylord St. - E.Louisiana Av. 6 E 6th Av. Union Depot - 17th St. - Broadway - E 6th Av. - Madison St.
7 S. Pearl Central Loop - 15th St. - Broadway - E 1st Av. - Penn St. - S.Pearl St. - E.Jewel Av. 8 University Park Central Loop - 15th St. - Broadway - E 1st Av. - Penn St. - S.Pearl St. - E.Evans Av. - Denver U. 10 Colfax Central Loop - 15th St. - E.Colfax Av. - Birch St.
28 W 44th Av. / E 28th Ave. Berkeley Pk. - Lowell Blvd. - 44th Av. - Tejon St. - 16th St. - 17th St. - Welton St. - E.28th Av. - Josephine St.
61 Larimer Sheridan Blvd. - W.Colfax Av. - Larimer St. - E40th Ave. & High St.
64 E 34th Av. Central Loop - 15th St. - Stout St. - Downing St. - E.34th Av. - Cook St.
72 Cherokee Central Loop - 15th St. - [15th St.] [Back: Curtis St. - 17th St. - Larimer St.] - Curtis St. - 13th St. - Delaware St. - Elati St. - W.6th Av. NB: Routes 81-84 were Interurban lines. Route 84 was operated by the Denver & Intermountain RR, a subsidiary of DT. Horse-drawn streetcars: 17 Dec. 1871 - 1890. 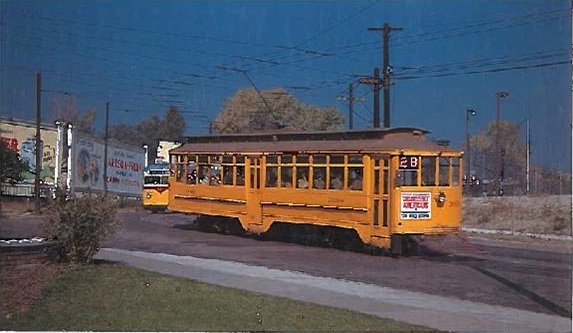 Electric streetcars (1st generation): 1888 - 3 June 1950. Light rail (2nd generation):7 Oct. 1994 - today. Commuter rail: 22 Apr. 2016 - today. Cable cars: 1888 - 1900. Streetcars (1st generation): 1067 mm. Interurban: 1067 mm. (routes 81,82,83); 1435 mm. (route 84). Light rail (2nd generation) and Commuter rail: 1435 mm. Lietwiler, C. "Denver: The politics of expansion", Light Rail & Modern Tramway, Aug. 1996 (59: 704), p.300-301. Lietwiler, C. "Denver: Winds of change are blowing cold", Light Rail & Modern Tramway, June 1995 (58: 699), p.170-175. 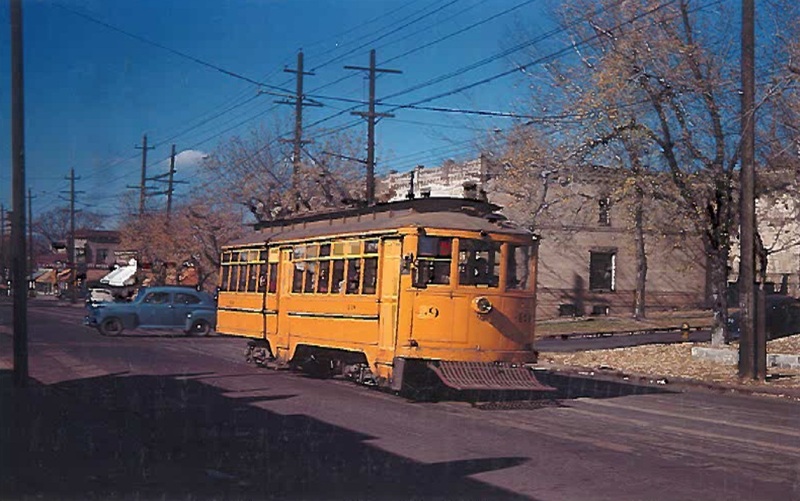 Pharris, K. Riding Denver's Rails: A Mile-High Streetcar History. Charleston (SC): The History Press, 2013. Robertson, D. & Forrest, K. Denver's Street Railways, Vol. 3: The Interurbans. Golden (CO): Colorado Railroad Museum, 2010. Simons, V. "Denver - FasTracks slowed by regulatory approvals", Tramways & Urban Transit, Oct. 2017 (80: 958), p.370-373. 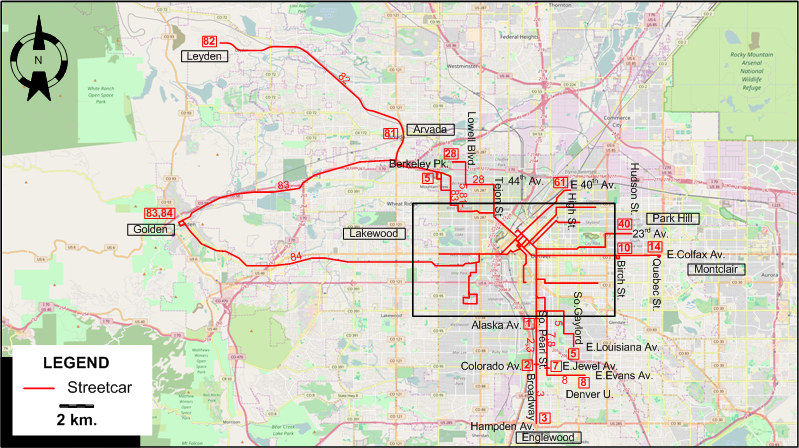 Simons, V. "FasTracks: Denver's Big Bang", Tramways & Urban Transit, July 2013 (76: 907), p.294-298. Wansbeek, C.J. 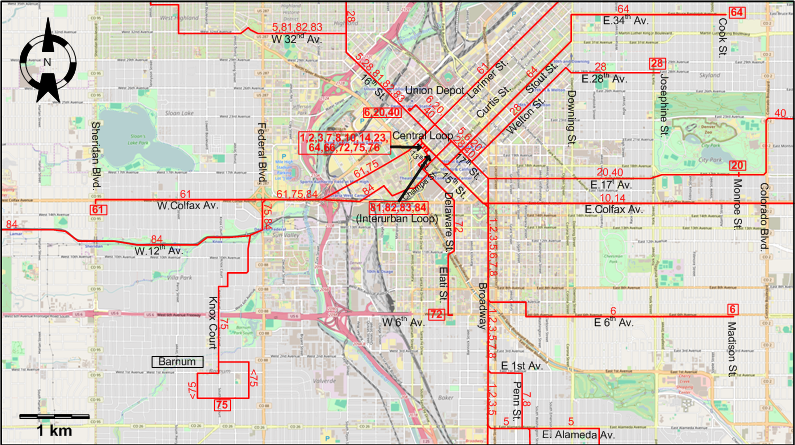 "Denver: Light rail expansion in all directions", Tramways & Urban Transit, March 2007 (70: 831), p.92-95. Official Route Map of the Denver Tramway Corp.
Special thanks to Russell Powers from Denver CO for information on the history of the Denver system.